Just seen these in Pouindland in Stockport. I have bought these before for about £4 from high street chemists. They are excellent for blisters as they actually stay on for a few days and really do cushion the area. They also have the invisible blister version too - pack of five. They are currently on offer in Boots for £2.99 but are normally £3.99. So stock up on these while you can at this price. Repel water, dirt and germs to prevent infection. Stay firmly in place for several days, allowing your skin to rapidly repair itself. 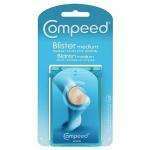 Compeed® - don't stop for a blister! Compeed Blister Gel Plasters provide a natural pain relieving action on the blister to stop the pain instantly, and absorbs moisture from the skin to form a thick soft gel that ensures optimum cushioning from rubbing and pressure.The gel plaster repels water, dirt and bacteria and can stay firmly in place for up to 3 days. Pic of receipt etc to follow. These are brilliant!! Hot hot hot! Excellent product, I hope they've got some left. These made a walking holiday much more enjoyable for me. Hot. Thanks! Amazing price. First learnt of these while doing the Coast to Coast walk 3 years ago. They became like gold dust. Over £5 a packet they were charging most places and you'd pay three times that once you've seen how good they are. Fantastic, hope they have them in my local store. Tried supermarkets own version of these but they dont compare.